Hear from some existing and previous Scholars on what motivated them to take part in the program, what surprised them along the way, and what they enjoyed the most about the experience. Since 2010, over 275 UBC graduate students have completed applied research projects to advance sustainability throughout the region as UBC Sustainability Scholars. Scholars come from a variety of academic backgrounds, including engineering, sociology, environmental sciences, urban planning, food systems, and others. Amber Heckelman is a doctoral student in Land and Food Systems. As a Sustainability Scholar in summer 2018, she worked on developing a measurement framework for community resilience with the Centre for Community Engaged Learning (CCEL) at UBC. What motivated you to apply to the UBC Sustainability Scholar’s program? The opportunity to engage in public scholarship in a way that aligns with my commitment to creating more sustainable, equitable, and resilient communities. What attracted you to the specific project that you worked on? My dissertation work explores key developments in resilience theory, so I was excited about the prospect of expanding my knowledge and understanding of resilience, and specifically, community resilience. What is community resilience? Why does it matter? Fundamentally, community resilience is about sustainability, equity, and empowerment. Operationally, community resilience is a suite of socioecological processes and outcomes that strengthen community capacities for overcoming challenges and improving quality of life. Essentially, it’s about cultivating place-based relationships that recognize the co-evolution of humans and nature. What makes the project that you are working on impactful in achieving sustainability? The community resilience framework that I have developed with CCEL can be utilized to facilitate reflexivity and collaboration to help ensure that CCEL's programming is indeed oriented toward building community resilience. Did you learn something surprising while working on your project? There's a growing consensus among researchers and practitioners that resilience building requires an integrative and collaborative approach, one that empowers communities and fosters collective action. Although not really a surprise, but something worth mentioning, is the fact that this approach is very much in alignment with CCEL's approach to its various programming. What did you enjoy most about working on your project? I enjoyed researching and reflecting on the accumulation of community resilience frameworks in the academic and gray literature. It was both interesting and rewarding to be able to identify key concepts, guiding principles, and features of community resilience that would be meaningful and useful for CCEL. I also enjoyed making figures and tables that synthesized complex information into more digestible illustrations/formats. What is the most valuable thing you learned or experience you gained through being a UBC Sustainability Scholar? Aside from what has already been mentioned, professionally, this opportunity allowed me to expand and diversify my research and writing portfolio. Nicole Malette is pursuing a PhD in Sociology. The aim of Nicole’s summer 2018 Sustainability Scholars project was to identify areas of needed support around Teaching Assistant wellness, and build capacity around TA wellness in departments across UBC. I applied to the sustainability scholar's program because I wanted to get more hands-on experience working with students at UBC, make more professional connections and to give back to my academic community in the summer months. What attracted you to the specific project that you worked? How does your project relate to your field of study, interests, and career goals? My dissertation research focuses on undergraduate student mental health outcomes, but because it involves working with large international data-sets I sometimes feel disconnected from the population that I'm trying to help. Working as a Sustainability Scholar gave me the opportunity to directly research and impact UBC student populations. What makes the project that you worked on impactful in achieving sustainability? Studying teaching assistant wellbeing is extremely important to achieving healthy and sustainable teaching communities at UBC. Teaching assistants are often responsible for grading, advising and tutoring undergraduate students in some of the first years of their study. However, professional development programs for university-level teaching assistants related to teaching skills often don’t include formal lessons on maintaining TA mental health or mental health skills. Much of the rhetoric around mental health in professional development courses tends to focus on how teaching assistants can help their undergraduate students manage their mental health problems. Few faculty training programs also focus on how instructors can aid teaching assistant well-being. This gap in training places university level teaching assistants at risk of experiencing more stress and inappropriately addressing their own mental health problems relating to their teaching experiences. My research with the Sustainability Scholars program is impactful in achieving sustainability because it demonstrated the wellbeing challenges faced by teaching assistants here at UBC and how the university can best support that community. Through my involvement with the Sustainability Scholars program, I learned just how many people at the university deeply care about improving student and TA mental health. Knowing that there are so many others working in different ways to create a more caring and sustainable learning community is really uplifting. What I enjoyed most from working on this project is the opportunity to make new connections with teaching assistants and scholars in the Center for Teaching and Learning Technologies at UBC. The people I worked with on this project are so inspirational in their care for student learning and wellbeing. The most valuable thing that I have learned through this experience is that addressing TA wellbeing is a multidimensional process that involves addressing both interpersonal and contextual factors here at UBC. Wendee Lang is a Master of Community and Regional Planning student. As a summer 2018 Sustainability Scholar, she mapped existing food goals and initiatives at UBC as a first step to developing a UBC Food Strategy. What motivated you to apply to the Sustainability Scholar’s Program? I became familiar with the program through my work at the UBC Sustainability Initiative. Positive reviews from past participants and the diversity of projects really appealed to me. When I was trying to satisfy my program’s internship component at the beginning of the summer, it seemed like a natural fit. This project spoke to a gap in my knowledge around food systems—although I have a strong interest in climate resilience and equity, I had yet to explore this area of urban planning. My project this summer provided me the opportunity to do so. How does your project relate to your field of study, interests, and career goals? My intention is to work as an urban planner and planning for food system sustainability is an increasingly important topic in this realm, particularly in the context of climate change effects on low income communities. Working with Dr. Tara Moreau throughout the summer provided me space to explore this topic and enrich my understanding of urban food systems. How does the project have an impact on achieving sustainability? In mapping food assets at UBC, we wanted to create both a resource for community members interested in the campus food system, as well as a tool of collaboration for asset managers and stakeholders. Providing baseline information on campus food assets, we hope, will help generate new ideas that can move UBC closer to its sustainability goals. What’s the most surprising thing you learned about the UBC food system through working on this project? The UBC food system is extremely diverse, due in part to the institution’s dual identity as a university and pseudo-municipality. As a result, the campus is able to act as a living laboratory and this experimentation and willingness to take risks in pursuit of sustainability is clear when viewing the food asset map. I feel very privileged to have been able to work so closely with Tara this summer. She is an infinite source of knowledge on food systems but approaches the topic from the position of someone who is continuously learning—a quality that I really admire. I hope to work with her again in the future. What is the most valuable thing you have learned or experience you have gained through being a Sustainability Scholar? Improving my presentation skills has been a big goal of mine over the past year. While we’re lucky at SCARP to have many opportunities to do so, during my time as a Scholar I often presented to a professional audience and this challenged me to improve more quickly. As a result, I think I am a much more solid presenter now than I was at the beginning of the summer. Diana Aguilar is a Master of Engineering Leadership student majoring in clean energy engineering. As a Sustainability Scholar in summer 2018, Diana worked on project to understand the impact of public electric vehicle (EV) charging infrastructure on EV adoption, trip behaviour, and lifestyles. I applied for the UBC Sustainability Scholar's program to follow up on my passion for sustainability, to put my professional experience and knowledge from my Master of Engineering Leadership (MEL) in Clean Energy Engineering program into practice, and to better understand EV (Electric Vehicle) adoption. What attracted you to this specific project? How does it relate to your field of study, interests, and career goals? In my overseas experience, I have worked on methods of making transportation more sustainable. The Sustainability Scholars project I worked on allowed me to understand the different types of electric vehicles and charging stations around Metro Vancouver. As a Master in Engineering Leadership in Clean Energy Engineering student, I’m always looking for opportunities to promote the adoption of renewable energy. This project was very much aligned with that goal, especially considering that more than 90% of British Columbia's electric power is produced by hydroelectric generation. This signals an opportunity to reduce regional greenhouse gas emissions by promoting the adoption of electric vehicles. How will your research into Metro Vancouver’s public EV charging infrastructure advance regional sustainability? While the market for EVs has grown in Canada, public charging infrastructure, as a key factor in EV adoption, has been and must be evolving to keep up with the trend in increased EV sales. We developed a survey to explore and describe the characteristics (e.g., attitudes, opinions) of EV owners in Burnaby, North Vancouver, Richmond, Surrey, and Vancouver to answer the following question: Is public charging important to EV adoption? The survey will facilitate the understanding of a) where EV owners charge their vehicles and why, b) what is important to them to continue to be passionate EV owners and to inspire potential customers, and c) how to help Metro Vancouver achieve its goal of reducing GHG emissions. We distributed the survey in-person and online. We also had an amazing idea! A flyer with a QR code and the URL for the survey to put on the windows of cars that had been left to charge! I learned that EV owners are very passionate and very willing to share ideas, doubts, and complaints about the EV charging infrastructure. Because of this, we are recommending that Fraser Basin Council and Metro Vancouver create a unique platform for EV owners to provide feedback. Being able to talk, even though sometimes it was only for 5 minutes, to EV owners and understand their expectations and needs related to the EV charging infrastructure. They gave us amazing ideas! We heard about different experiences in other countries, such as in Sweden and the US, that for sure could make a difference to EV adoption in Metro Vancouver. What is the most valuable thing you learned or experience you gained through being a Sustainability Scholar? The most valuable thing I learned was the importance of not only working on a project, but of being part of a whole group of Scholars dealing with incredible challenges who are using their own experiences and knowledge to solve problems and overcome obstacles to achieve their project goals. Yehan Chen is a Master of Civil Engineering student specializing in environmental systems engineering. Her summer 2018 UBC Sustainability Scholars project focused on the impact of electric vehicle (EV) charging stations on EV adoption in Metro Vancouver. I come from Shijiazhuang, a city with severe air pollution and water pollution, which is why I decided to pursue a degree in environmental engineering. The UBC Sustainability Scholars program was a great opportunity for me to test my skills and apply my knowledge to the real world. Electric Vehicles have been a really hot topic in recent years. Metro Vancouver is currently encouraging electric vehicle adoption by providing better public charging services to electric vehicle owners. This also supports actions to reduce emissions to meet the province’s GHG targets. Helping them to achieve that goal aligns with my personal goal as a student in Environmental Engineering and my goal to pursue a career as an environmental engineer. Electric vehicles run on electricity instead of fossil fuel, which will not produce any greenhouse gases during running. If people switch from conventional vehicles to electric vehicles, air quality will improve a lot in Metro Vancouver. Did you learn anything surprising while working on your project? Currently, there are over 250 charging ports in the City of Vancouver alone. I did not know that the EV market was so large or that the government had initiatives in place to support it. We did in-person surveys at EV charging stations to collect our data, which I really enjoyed. I had chance to talk to a variety of nice people who are passionate about their EVs. Working from home is a big challenge but also a great experience. I learned to motivate myself all the time and get along well with myself. Charles Lankester is a Master of Engineering Leaderships student. His summer 2018 Sustainability Scholars project focused on understanding the evolution of the UBC Vancouver campus energy systems and infrastructure, including the planning and decision-making processes, challenges and key enablers for innovation. I am currently completing my Master of Engineering Leadership with a focus on high performance buildings, where I am learning to analyze energy models, review sustainability indicators for building performance, and consider the environmental impact of buildings. As a mechanical engineer and having worked as a facilities engineer, my understanding of the behaviours of a building regarding energy consumption, waste and water management, and air conditioning systems provides me with a unique set of skills to analyze building performance. I wanted to be a part of an initiative to analyse an ideal sustainable campus like the University of British Columbia, where I can learn best practices and understand how to improve upon an already advanced system. Climate change is affected by Greenhouse Gases (GHG) and CO2 emissions. Buildings account for 39% of CO2 emissions and are contributors to GHG emissions as well; therefore, understanding building performance and how to enhance it is a necessary step to addressing climate change. Energy management has to be dealt with on all fronts: energy supply and energy demand. The interaction between the energy infrastructure and the building cannot be analyzed separately. When it comes to sustainability, it doesn’t matter who you are or what you are doing right now, everybody can make a difference. It doesn’t matter how big or small your contribution is— it's still something. MK Anand is a Master of Engineering Leadership student specializing in clean energy engineering. As a Greenest City Scholar in 2018, MK developed several models to help the City of Vancouver understand the options for establishing a solar energy utility on urban rooftops. What motivated you to apply to the UBC Sustainability Scholars program? I moved to Vancouver because it’s a city deeply committed to meeting ambitious renewable energy goals. As I am doing my Masters in Clean Energy Engineering, my project was a golden opportunity to help contribute towards the City of Vancouver’s 2050 100% renewable goals by helping to set up a solar energy utility. I would also get the experience of working in the public sector as opposed to the years of private sector experience I have. As a mechanical engineer with large infrastructure experience, being involved in a smaller scale research and feasibility project was a good opportunity to broaden my field of experience. My interests have always been to work on solving big problems and the challenge of helping to get Vancouver to its Greenest City goals was very attractive for me. My long-term goal is to work on implementing clean energy technologies to reduce the City's footprint either within an existing organization or on my own so this project aligned perfectly with this. For a city that is so sustainability focused, there is a dearth of visible solar projects due to the clean energy available from BC Hydro. Increasing the amount of solar energy produced increases the resiliency of our electricity grid, and helps us meet the need for a future where heating and vehicles might be electrified. It also would reduce our reliance on cheap electricity from the US that might come from a variety of sources, not all of them clean. I learned about the complexities of working within a public organization where the taxpayer is paying for everything and how carefully the City considers every decision it takes so as to not put the taxpayer at any risk. I enjoyed the aspect of interacting with all the solar energy suppliers in town and the challenge of getting them excited about a project that the City was interested in making a reality. I enjoyed tweaking our financial models to a point where projects became attractive to pursue. What is the most valuable thing you learned or experienced through being a Sustainability/Greenest City Scholar? I learned about public perceptions of solar and sustainable technologies (e.g., it's too expensive, the sun doesn't shine in Vancouver, etc.) and what to say to shift perceptions and mindsets (e.g., fossil fuels benefit from subsidies, Vancouver gets more sun than Germany, etc.). Iris Jiang is a Master of Forestry and Conservation student. As a Greenest City Scholar in summer 2018, she worked on a project to understand the impacts of climate change on street tree health. The purpose of the project was to provide guidance to the Parks Board on how to decrease transplanting stress and enhance the health and longevity of trees planted along Vancouver streets and parks. My academic background is in urban forestry, so I feel confident applying my skills to field-related projects. This program gives me an opportunity to apply what I have learned in class to real life. Also as a Vancouver resident and a UBC student, I feel a sense of responsibility to devote my efforts to helping realize Vancouver’s Greenest City goals. What attracted you to the specific project that you worked on? How does your project relate to your field of study, interests, and career goals? My long-term goal is to become an Urban Forestry Planner, and I am particularly interested in plant health care and risk assessment. This project focused on analyzing data from the City of Vancouver’s tree inventory, performing field observations of the condition of the newly planted trees, and prescribing recommendations for future management practices. The working duties were closely related to my interests and career goals. According to goal 6 of Vancouver’s Greenest City Action Plan, getting access to green space is vital for developing a sustainable and enjoyable city. Specific targets include planting 150,000 new trees and bringing the tree canopy cover back to 22% by 2050. However, even though the Vancouver Parks Board plants several thousand trees per year, those young trees still suffer from transplanting shock caused by things like water stress and mower machine damage. My research contributed to the reduction of tree mortality, and it contributed to optimizing tree watering protocols and soil treatment practices. The most surprising challenge for me was not doing the literature review research, nor learning new technical skills, but rather getting comfortable with driving around Vancouver to find and locate the recorded young trees. I surprisingly found myself with much better driving skills! The most enjoyable thing about this project was interacting with my mentor. He taught me all kinds of useful forestry knowledge and shared a lot of interesting stories from his previous work, which intensified my determination to pursue my career goal. The most valuable thing for me was to meet up with other Scholars during orientation, presentations, and other self-organized activities. They come from a wide range of fields, such us engineering, landscape architecture, education and so on. Learning about their research helps me get more familiar with what kinds of actions the City is working on, and their opinions let me see things from another perspective. I also made many new friends, which made my summer more interesting and meaningful. Marieta Marin Bruzos is pursuing a PhD in Soil Biology. Her summer 2018 UBC Sustainability Scholars project for Metro Vancouver examined best practices management of a forest fungal pathogen (Brittle Cinder fungus) found in the regional park system. The program supports the sustainability goals for the region, which gives us a chance to make a real impact while also having the experience to work with off-campus partners. The program is also very flexible and allowed me to do other research and work at the same time. The project I am working on is about the management of a fungal pathogen. I did a similar job before, but in agriculture, so it aligned perfectly with my background, interest and career goals as I am doing a PhD in soil biology. The sustainable management of forests is essential to preserving this natural resource, which provides beneficial services for future generations. It is also critical from a global perspective. The fungal pathogen is called Kretzschmaria deusta (also known as Brittle Cinder fungus) and it is affecting large maple trees in the Metro Vancouver region. The management of the pathogen helps to control the spread of the disease, minimizing the impact of the fungal infection in the local forests. In this way, we can preserve maple trees for the future. As an international student, I did not know much about the local herbs and vegetation. As I learned, some of them can be very itchy! I enjoyed the field work the most—I had the opportunity to visit all the Metro Vancouver regional parks, walk in the forest and connect with nature while doing my job. Being a Sustainability Scholar gave me the chance to apply my previous knowledge about integrated pest management for crops in a completely new field for me (forestry), expanding my research focus. Sri Apoorva is a Master of Civil Engineering student. 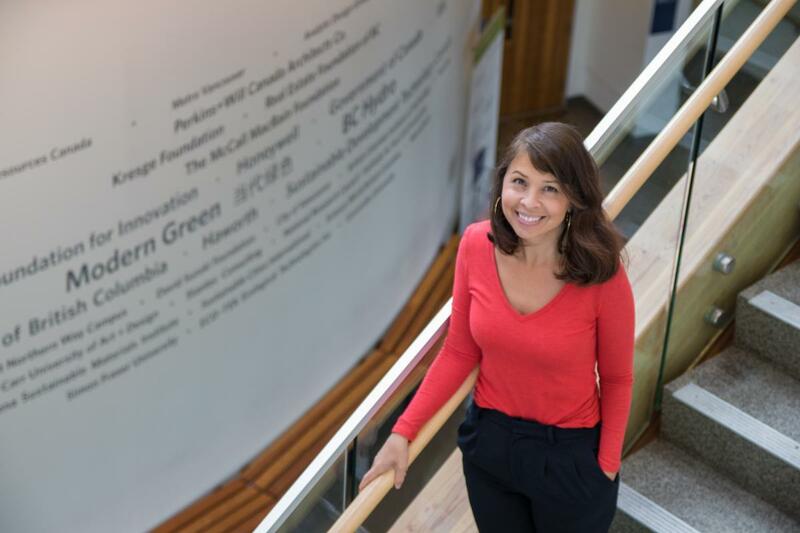 In summer 2018, she completed a Greenest City Scholar project to revise the City of Vancouver’s current method of calculating the GHG emissions produced by contracted services. I am passionate about sustainable construction and I have a particular interest in reduction of GHG emissions. As I prepare for a career in sustainable construction, I am eager to gain a more detailed understanding of the field. After reading the project description, I felt that the project (which was to revise the existing methodology for calculating and reporting on GHG emissions from contracted services) would provide me an opportunity to combine my interest in sustainability with what I’m learning about engineering services at UBC. The City of Vancouver is working towards zeroing its carbon emissions. Reducing greenhouse gas (GHG) emissions has remained one of the top priorities of the Greenest City Action Plan, the Renewable City Strategy, and the Corporate Green Operations Plan. Goods and services procured by the City continue to be the key contributors to GHG emissions. This project will help the City of Vancouver’s Supply Chain Management, Sustainability and Engineering Services departments assess the magnitude of emissions associated with a good or a service to understand the strategic importance of suppliers as a part of the corporate GHG reductions plan and to focus on contractors with the most significant impact. My research involved identifying gaps in the City of Vancouver’s existing methodology for calculating and reporting on GHG emissions from contracted services and recommending ways they could revise their methodology for reporting to the province. It also involved identifying the department with the highest GHG emissions from contracted services based on the Life-Cycle Cost Analysis (LCA) methodology, and identifying subcategories of spending and suppliers with the greatest GHG emissions. I also developed a tool for City departments to use to estimate the GHG emissions from a good or a contracted service using the LCA methodology. Yes, I learned that Vancouver is a pioneer in sustainability practices and I was surprised to know that sustainability is imbued at all levels of operation in the City of Vancouver. I enjoyed working onsite at the City as it gave me an opportunity to learn the fundamentals of working at a local government. I also got an opportunity to learn from experienced mentors working in the field that I see myself working in someday. Finally, I was extremely happy to be able to contribute something to the City that I live in. I am going to cherish the moments I worked at the City as the experience taught me a lot. Unlike doing academic research, working on a project in a corporate environment is both unpredictable and interesting. I had to work with close deadlines, organize meetings with stakeholders in different departments and put my work together in a short span of time. The most valuable thing that I learned in this journey is how to multi-task and work in a fast-paced environment. I enjoyed doing meaningful and challenging work and I thank the UBC Sustainability Initiative for giving me the opportunity to explore and experience working in an area I’m passionate about before beginning my career in sustainability. Gillian Fuss is a Master of Forestry and Conservation student. As a Greenest City scholar in summer 2018, she worked with the water design group in the City of Vancouver’s Engineering Services department on a project exploring the opportunities and constraints to water conservation through irrigation management. I have a science background, and have done most of my research in ecology. However, I wanted to branch out more into natural resource management and environmental sustainability, even policy. This program was a great way to dip my toe into the public service, and understand what municipalities do and how my research would be applied. For my masters I studied water quality in rural areas. My Scholars project dealt directly with water conservation in an urban area. It complemented and expanded the portfolio of experience I’ve been building in a positive way. It also played up my interests in equity and science communication. I would love to continue working in a similar field, improving the way we manage our natural resources and exploring those limitations and opportunities. I was working directly on water conservation, which has become a hot topic in the last few years as we’ve realized our drinking water supplies are not unlimited. Water is still pretty cheap in Vancouver, so we are actually one of the highest water consumers in the world. I think my work will help the City be more efficient in how much water they use, while providing the necessary services. I’m also working with the Vancouver Parks Board. They account for 2% of the City’s overall water consumption, but have fewer users, so every change has the potential to have a big result! What are some methods of water conservation that you explored while completing your project? My project was really interesting in that it spanned looking at efficiencies in both the physical delivery of irrigation and the management of irrigation systems. This includes everything from using moisture sensors on sprinkler systems to prevent over-watering, to understanding the number of maintenance staff that were available to fix problems, and knowing what treatments are used to keep grasses healthy. It seemed like there was room for improvement in the systems themselves, but also in attitudes to how we approach watering. That is, if water should be applied generously, if other methods should be used to reduce water use, or even if the City should use plants that require less water. One of the more interesting points, though, was that how much water we think we need to use is completely related to our expectations. For example, the expectation that some parks in Vancouver should be green all summer when the grass would naturally go yellow and dormant during this period. Or, even the expectation that parks should be big, green lawns or fields instead of more wild areas or forest. Changing our expectations could really reduce the amount of water we think we need in these areas. I learned so much working on this project. I think what surprised me the most is how all the staff I talked to are concerned about sustainability; no matter what position they’re holding. That said, there are so many nuances with providing services for the public that can make experimenting or trying new things difficult when there’s a risk of interrupting a service. Everybody at the City is so nice! It was amazing to be surrounded by such friendly people who are willing to take time out of their busy schedules to talk to me about water conservation. What is the most valuable thing you learned or experience you gained as a Greenest City Scholar? I think just seeing how science is applied on the ground, and the different strategies a city can use to be more sustainable! Vancouver has so many different programs operating all at the same time, a lot of which are at the forefront of sustainability! Natalie Chan is a Master of Geomatics for Environmental Management graduate. 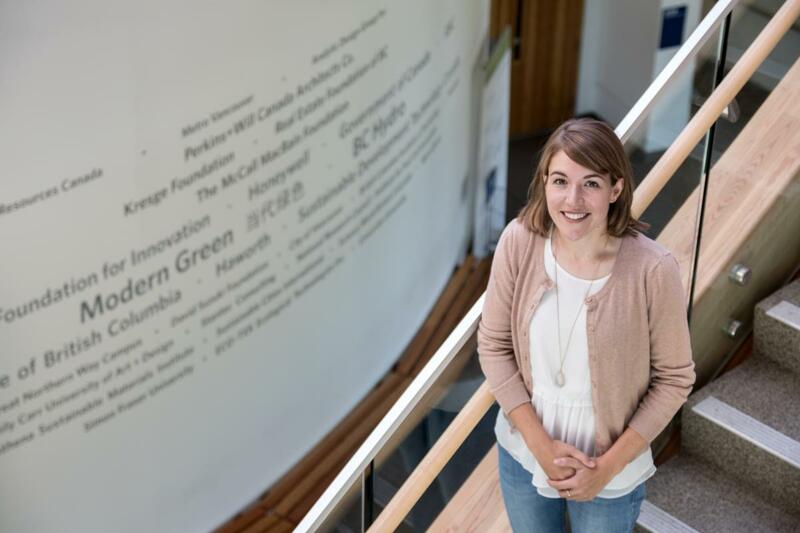 In summer 2018, she worked as a UBC Greenest City/Healthy City Scholar to develop a web map application for the Community Impact Real Estate Society (CIRES). CIRES supports social enterprises and non-profit organizations in Vancouver’s Downtown Eastside. I gained an interest in urban planning and social sustainability while pursuing my master’s degree in Geomatics in Environmental Management. The Healthy City Strategy is ambitious and has a great vision of how to improve the City and its residents’ well-being. A chance to work in an environment that strives to achieve sustainability is rewarding. What does the web map application do? How does it contribute to reaching the Healthy City goals? The Community Impact Real Estate Society (CIRES) is one of several initiatives underway that is helping to achieve the goals in the Downtown Eastside Community Economic Development Strategy, Healthy City Strategy, and the Downtown East Side (DTES) Plan. CIRES role is to manage cross-subsidized retail spaces through which they aim to support social enterprises, non-profit organizations and businesses that work on reversing the impact of social isolation, limited employment opportunities, and unaffordable retail and service options for low-income residents in the DTES. Through the management of these commercial spaces, CIRES contributes to the development of affordable socially inclusive businesses and economic opportunities for low-income workers. The purpose of my project was to assist CIRES in developing an efficient and updateable geospatial dataset that establishes a baseline of space, uses, and metrics for its retail portfolio. The online interactive map application I created will aid CIRES in making data-driven decisions and to track and communicate the impact of its portfolio over time. As a graduating student with little experience in the geomatics field, this project was the outlet for me to apply the skills and knowledge I gained in school. I was able to utilize my geomatics skills to develop an efficient GIS platform and other deliverables for this project. My deliverables include creating an online interactive GIS platform and a geospatial database for CIRES. By showing a snapshot of the geographic data in the Downtown Eastside, the application aims to provide a baseline of space, use, and metrics for CIRES’s commercial portfolio, aiding CIRES in making data-driven decisions. During this project, I encountered several obstacles and took them to the online GIS community. I was surprised at how friendly and helpful the GIS online communities are. Thanks to their prompt replies, I was able to explore more options while configuring the app and speed up my process with some of the tips and tricks. The opportunity to work on a meaningful project with some of the smartest and inspiring people is what I enjoyed most as a Healthy City Scholar. The experience of planning my own project and creating an online map application also gave me confidence and the necessary reassurance that I am ready for the next step of my life. I really enjoyed the experience of planning my own project, learning how to communicate with stakeholders, and setting deadlines for myself. I also learned so much from the smart and inspiring people around me. I will always cherish the memories I made and the friendships I created through this amazing journey.